These cute fox plushies are inspired by Japanese Kabuki theater and the mythical kitsune! Each fox represents its own element. They're the perfect size for cuddling! Each fox is approximately 17 inches tall from feet to ear tip and 13 inches in length. They're made from soft minky fabric with embroidered details and they each have their own custom printed bow! The Kabuki Foxes are original PlanetPlush designs and have been manufactured in limited quantities. These cute baby fox plushies are inspired by Japanese Kabuki theatre and the mythical kitsune! Each fox represents its own element. They're approximately 6 inches long and made of soft minky fabric. 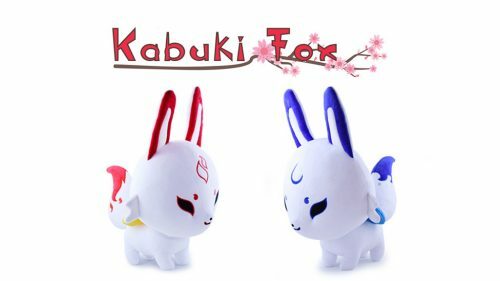 The Kabuki Foxes are original PlanetPlush designs and have been manufactured in limited quantities.